Or – how to promote your competitor’s product. 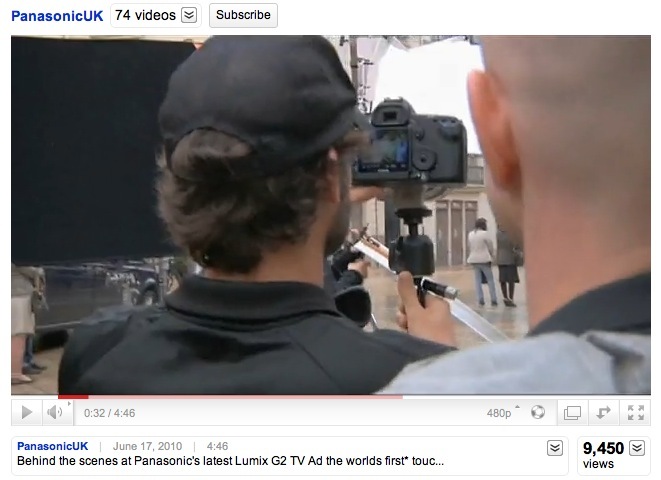 Recently Panasonic UK released a behind-the-scenes video from the new Lumix G2 commercial. The tagline for their video is Everything Matters. By this, I assume they are referring to everything except for the fact that they shot it on a Canon 5D MkII and included footage on YouTube clearly showing multiple Canons (even their distinctive white L lenses) in the BTS video. This seems like a bizarre error. I have trouble even imagining how it occurred. They decided to shoot a Panasonic ad on Canons, then decided to shoot behind-the-scenes video showing them doing this, then edited and color corrected that BTS video, then compressed it for the web, and finally someone at Panasonic UK uploaded it to their YouTube account. Personally, I’m relatively brand agnostic. I love products and companies – but my love is conditional. If I like a company, it’s because they treat me well (mmm…In N Out). If I like a product, it’s because it works well for my needs (Predator drones). If I like a lot of products, then I probably like the company (which actually applies to both Canon and Panasonic for me). Now, let’s ignore for a moment all the various brand identity and marketing rules they’re breaking, and instead focus on why this is technically infuriating. Why in the world would a company like Panasonic hire a director or DP who then decides to use Canon? Now, if Panavision hired me to shoot a still photo of David Fincher sitting behind a Panavision Platinum – I might well use a Canon, because there is no technically appropriate Panavision product. Yet this Panasonic commercial was shot with a camera that was probably *not* even the best choice. As much as I love the 5D MkII, this commercial would be perfect for the GH1, which is made by…Panasonic. It shoots at 60fps (great for action sequences) and is much smaller than the 5D MkII or even the 7D (great for actor rigs). I’m not saying the Canon was the “wrong” camera. I shoot Canon all the time. But I also shoot Phase One and even Panasonic. I use the right tool for the job, but in this case I could easily shoot this commercial with the Canon 7D or the Panasonic GH1 (actually wouldn’t choose the 5D MkII because its slower frame rates is less flexible for action). When it’s a coin flip on which camera to use, it’s just a strange behavior that they chose their competitor’s product. While I personally really like the Panasonic Lumix G series, Olympus certainly has their marketing more organized. Now when we add the rules of branding and marketing into the mix, this “Panasonic” behind-the-scenes video transforms from really annoying to an error of mind boggling proportions. If you work for Pepsi, they don’t even want you to travel on an airline that serves Coca-Cola products. And vice versa. It sounds silly at first, but these are real concerns with millions or billions at stake. Besides not wanting to give any money or support to your competition, it also avoids the possibility of a photo of the Head of Marketing for Coca Cola sitting next to his (presumably First Class) Pepsi drinking seatmate. Panasonic President Fumio Ohtsubo recently spent about 30 billion yen to consolidate Matsushita and National all under the Panasonic brand name. I imagine he would not be happy to know that their money is being spent to promote a competitor. Knowing that’s the landscape, how could this have happened? Having spent a significant amount of time in Japan, I have trouble imagining this mistake would ever happen there. They take company loyalty (not just branding) extremely seriously. Does Panasonic’s Japanese right hand (カメラの手?) not know what its UK left hand is doing? Possibly they are having difficulty bridging the cultural divide. After having worked for many companies that have Japanese offices and Western offices, I can easily imagine Panasonic UK and Panasonic Japan having serious communication problems. I am often amazed at the extent of the cultural gap and how little is done to bridge it. 残念ですね。I have even found myself as the liaison between employees in Japan and the US…both theoretically working for the same company. When Panasonic Japan made a video about their ToughBook series of laptops, they clearly display that the video was made with a Panasonic Lumix camera – and it looks great. These aren’t even the same departments (computers and cameras), yet they clearly understand brand consistency. In the UK, apparently the camera department isn’t even aware of the importance of internal brand consistency. In any event, the Panasonic Lumix series and the Canon DSLR series are both great, but Canon’s advertising is far better organized. I really hope Panasonic uses this as a wake up call and gets their brand strategy together. That way we won’t have to see their engineering outpace their marketing.